Astronomers found an extraordinarily close stellar pairing in the globular cluster 47 Tucanae, a dense collection of stars located on the outskirts of the Milky Way galaxy, about 14,800 light years from Earth. Credit: X-ray: NASA/CXC/University of Alberta/A.Bahramian et al. If every 28 minutes for an orbit, then how many mph/kph is this star moving? this is about 1.3% the speed of light. By comparison, the mass of our sun is 1.99*10^30, so the BH is only slightly more massive than our own Sun. Some of you may be thinking that this mass may be too low for a stellar mass BH, seeing that it just barely below the Chandrasekhar limit (1.4MSol or 2.765*10^30) – but remember that we were given approximations of the distance the WD is orbiting as 2.5LD, and the time to orbit being exactly 28 minutes. These approximations will invariably contaminate the mass calculations. This is not the case of rotation of the white dwarf around the black hole. 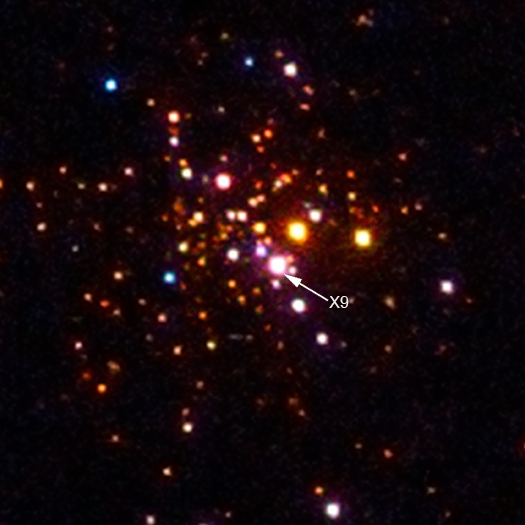 This can be a binary system where the star can be considered neutron star which has not yet exploded. At such a short distance white dwarf around the black hole, its speed should be equal to the speed of light.